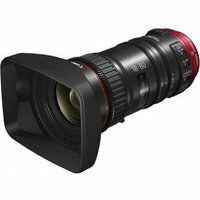 The first in a new class of Canon lenses, the CN-E18-80mm T4.4 cine-servo zoom with EF-mount is a 4K-ready video lens designed for handheld shooting. A bridge between traditional Canon EF photography lenses and CN-E cinema lenses, the lens is ideal for filmmakers and documentary shooters who want the control and quality of cinema optics with the lightweight, compact design and features of photography lenses. Its cinema-style, large-format design brings high-end quality cine-servo features, such as super-smooth servo zoom and focus, and it's also fully compatible with Dual-Pixel AF cameras like the C100 Mark II and C300 Mark II.